"I truly believe that the wicket played a big role in the success that he had. The stats, even in the Ashes, say that he picked up a lot of lower-order wickets." So said Graeme Smith of Mitchell Johnson after the Centurion Test. Perhaps to Smith denial is just a river in the north of his continent. Johnson picks up a lot of lower-order wickets, but he picks up a lot of wickets full stop. Top, middle, bottom. Notably he removed Smith and his opening partner Alviro Petersen in both innings in Centurion. And while Port Elizabeth may offer up a slightly less helpful pitch, Johnson showed during the Ashes Test in Adelaide that he is more than capable of extracting life out of a seemingly unresponsive surface. And, let's face it, it's all about Johnson at the moment. If he keeps going in his current direction, he will bowl Australia to yet another series win in South Africa. If his pace slips or he loses consistency, South Africa may find a way back into the series. If that seems too simplistic, it can be conceded that there are other factors at play. It is just that Johnson has the power to render most of them irrelevant. Not all of them, though. What he cannot significantly impact is South Africa's own bowling, and they need a lift from Dale Steyn, Vernon Philander and Morne Morkel. Where South Africa could fight back is if they keep Australia's runs low. South Africa in recent years have displayed a remarkable ability to avoid clumps of losses, but last time they were defeated in two consecutive Tests it was by Australia, in South Africa five years ago, during a series in which Johnson had a major impact. It was also the last time they lost any Test series, anywhere. Unless they turn things around in Port Elizabeth, that drought will be broken. AB de Villiers showed in Centurion why he is the No.1-ranked Test batsman in the world. He was the only South African who consistently looked comfortable against Johnson, top scoring in both innings and almost reaching a century in the first. But batting at No.5 means de Villiers may run out of partners if Johnson continues to terrorise the lower order, so it will be interesting to see how South Africa use him through the rest of the series, and whether his wicketkeeping duties will have any adverse effect on his batting. Alex Doolan might have missed out on a century on debut but his work with the bat and in the field showed that he belongs at Test level. Composed at the crease and classy in his strokeplay, Doolan gradually became more confident during his second-innings 89 but also showed a willingness to leave the ball and make the bowlers come to him. At short-leg he was outstanding in the second innings, clutching two reflex catches that would have had some players flinching. All in all, it was an encouraging start. Ryan McLaren has been ruled out after being concussed by a Johnson bouncer and that leaves South Africa with the choice of another bowling allrounder or a specialist batsman to replace him. 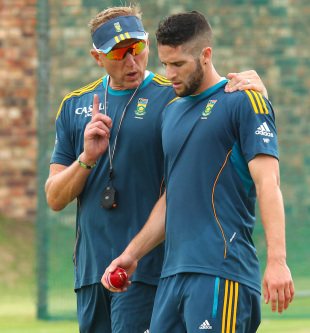 Wayne Parnell would be the closest to a like-for-like swap but Dean Elgar would bolster a batting line-up that was bruised and browbeaten by Johnson in Centurion. There is also the possibility that both Elgar and Parnell will come in and the spinner Robin Peterson could be left out. South Africa have also added Quinton de Kock to the squad as cover for Alviro Petersen, who has a viral infection. South Africa (possible) 1 Graeme Smith (capt), 2 Alviro Petersen / Quinton de Kock, 3 Hashim Amla 4 Faf du Plessis, 5 AB de Villiers (wk), 6 JP Duminy, 7 Dean Elgar, 8 Wayne Parnell, 9 Vernon Philander, 10 Dale Steyn, 11 Morne Morkel. Australia are unlikely to make any changes given that Shane Watson is still unavailable due to his calf problem and the two batsmen who came in to the side in Centurion, Shaun Marsh and Alex Doolan, both performed beyond expectations. Australia (probable) 1 Chris Rogers, 2 David Warner, 3 Alex Doolan, 4 Shaun Marsh, 5 Michael Clarke (capt), 6 Steven Smith, 7 Brad Haddin (wk), 8 Mitchell Johnson, 9 Ryan Harris, 10 Peter Siddle, 11 Nathan Lyon. The Port Elizabeth pitch is renowned for being on the slow side but a thick covering of grass remained a couple of days out from the Test, giving some hope that there could be assistance for the fast bowlers. The forecast suggests there could be rain at times during the match with temperatures generally in the mid 20s. "We've lacked a bit in real competitive cricket coming into this series. It's a quick turnaround and we have to adjust well to play winning cricket in Port Elizabeth." "I think if the wicket stays like it is it will be a three-dayer, expecially with two fantastic bowling attacks. So I don't think it will stay like that."